It's a case of Marching Madness! 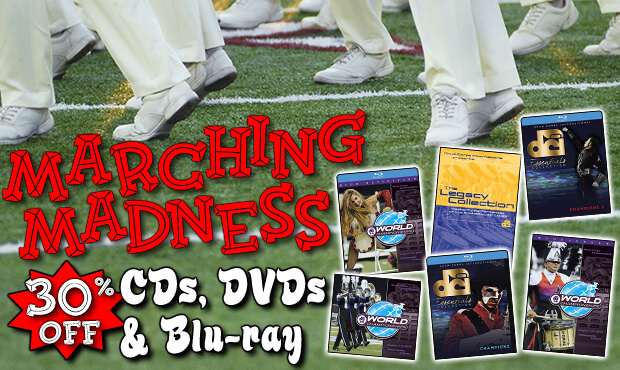 Marching Madness has arrived at DCIstore.org! Drum corps season is ramping up, and to get you ready for the coming summer, you can take advantage of a 30 percent discount on Drum Corps International's entire collection of in-stock audio and video titles. Hurry, this sale will be valid only until Monday, March 30! Re-live all of your favorite corps performances from the 2014 DCI World Championships on CD, DVD and Blu-ray disc. Three separate volumes of classic World Championship performances featuring completely re-mastered audio and video up-converted to high definition Blu-ray disc. World Championship Finals performances from 2009-2013 on high definition Blu-ray disc.